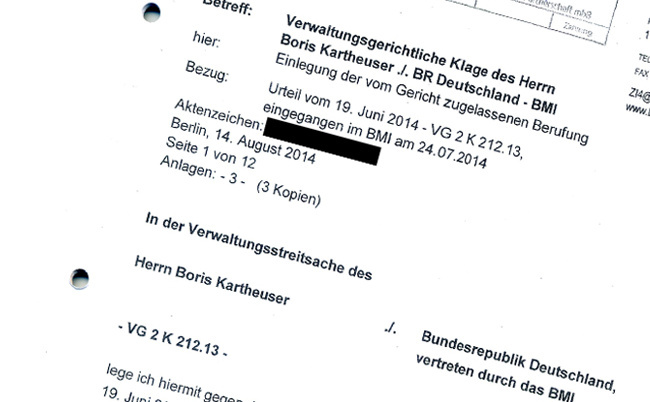 investigative journalist Boris Kartheuser won a right-to-information case against the German government. In a guest post for OJB, explains how he came to use a new crowdfunding site to raise money to pursue the case after the government appealed. We all remember the pictures of uprisings in Libya, Egypt, Bahrain or Tunisia a few years ago. Hundreds of thousands of people marching in the streets to protest against oppressive and corrupt governments. Many of these protestors paid a high price for their courageous uprising: shot in the streets; arrested, tortured and killed in prison. Some were caught because authorities were able to monitor every step they took, every email they wrote and listen to every conversation they held over the phone – using surveillance technology developed in countries such as Great Britain, Italy and my own country: Germany. As an investigative journalist I wanted to know how the German government may have helped promote the sale of this technology to dictatorships and despots like Muammar al-Gaddafi. Did the companies in question receive help from the Ministry of Economic and Business Affairs to export the technology? Were they granted structural aid? And were Angela Merkel and her ministers accompanied by company representatives when travelling abroad? To get answers, I sent questions to most ministries in 2011. But I received very little information. Worse, many responses contained inaccurate or misleading information. This is where I decided to go to court in order to get correct answers. I filed a lawsuit against the Ministry of Economic Affairs and the Ministry of the Interior. I based my suit on the Informationsfreiheitsgesetz. This is a German law – disliked by most ministries – that grants citizens access to certain information held by public authorities, comparable to the Freedom of information Act in the UK. The court agreed in most respects with my argument. And both ministries were ordered to answer most of my questions. But instead of finally telling me which companies had been helped by the Government to export their surveillance gear, the ministries appealed the decision. This not only means that any release of information will be delayed another few years: it also means that I will have to spend a lot more money to fund those lawsuits. Lawyer fees alone have already reached 9,000 Euro over the last years. Thankfully, I received funding from the German branch of Reporters Without Borders and the trade union Verdi. But that does not cover my costs. And at this point, I turned to crowdfunding. 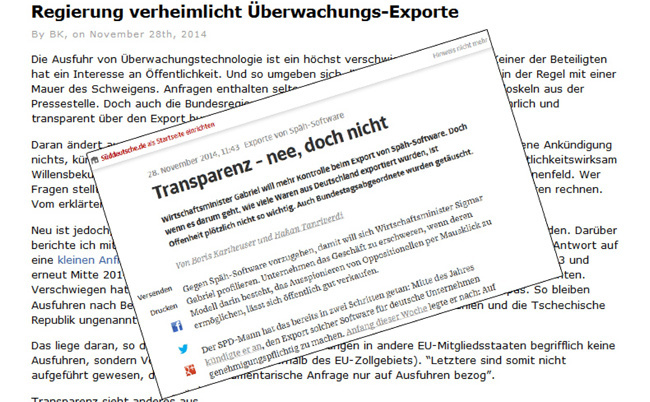 I spoke with some major newspapers in Germany about my research and my reports – and even agreed how we might publish a possible story. But the question remained: how to handle the lawsuit and the costs. Some newspapers offered to pay a fee in exchange for exclusive information. But this fee would have covered only a very small part of my expenses. Other media houses offered to completely take over the lawsuit – on the condition that they use all the results without my involvement. I didn’t like either solution. But I was lucky. Friends working for the Berlin-based investigative non-profit newsroom Correct!v contacted me and asked if I was interested in being among the first to use their new crowdfunding site. The platform was designed to raise money for independent investigative stories. And it has been very successful: four of the first six stories have already hit their fundraising targets. One of the key appeals of the site is that supporters can be confident they will get a story in exchange for their money: journalists working for Correct!v administrate money raised through the site, and guarantee to take over if the original author is not able to continue working on the project. That means in my case that I can keep up my research and continue the lawsuit without being afraid that the high costs will obstruct my work. And I do not have to hand over all rights on the story. Correct!v asserts the right to publish all stories, but does not interfere with the content – something important to me after having researched the subject for over 3 years: I want to be able to tell the story without constraints, and remain as independent as possible. the Deutsche Überwachungsexporte crowdfunding page. The crowdsourcing page is now entering its final few days – and I have already hit my intended target of 4500 Euro. That should be enough to finance the costs of my next appearance in court. After fighting on my own for over three years I am really happy about all the support and encouragement I have had. So why do I keep asking for money? Well both ministries are known for never giving up in court. And, well, why should they? They can spend as much of the taxpayer’s money as they want on Germany’s most expensive lawyers. And losing in court would mean more transparency in the future. Which is not to their liking at all. So I am quite sure that this meeting in court will not be the last: if they lose, they just appeal As they did last time. If I lose, I will certainly appeal as well. That means that I am already gathering money for the jurisdictional battles to come. Correct!v makes sure all funds are used for the lawsuit alone. So what happens with any excess money once all this is over? It goes straight to Doctors Without Borders. This is an organization I trust and which verifiably put 85 cent of every Euro into help projects over the last years. Only 15 cent went into administration and marketing. So if you want to back me financially or simply want to express your support you can give one Euro or more at the Deutsche Überwachungsexporte crowdfunding page. This entry was posted in online journalism and tagged Boris Kartheuser, Correct!v, crowdfunding, Informationsfreiheitsgesetz, Muammar al-Gaddafi, Reporters Without Borders, Verdi on January 27, 2015 by Paul Bradshaw.